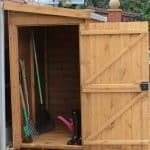 Not only does the 10′ x 6′ Traditional Pent Security Shed give you plenty of room to store things like a few bikes, gardening items, tools and many more things. 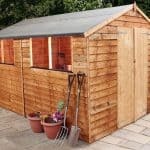 It is also one of the most strong and secure sheds that you can get. The design of this shed is very solid looking where it will make thieves think twice before trying their luck. The small windows on one side of the shed will allow light in, but they do a great job in keeping nosey neighbours out. A good sized door that is also very secure has been used to allow easy access, but also so that it shuts very firmly. The whole shed is made with some very strong redwood that will be given a free basecoat treatment. A very firm, rounded edged frame is supporting 12 mm thick, tongue and groove shiplap cladding. It is not just the walls that are very strong, as the floor and the roof have been made using tongue and groove boards. All the fixtures on the shed are security based such as the hinges on the door which are not just basic ones, but security bolted hinges to keep that door shut and also stop it from sagging over the years. No rain is getting inside this shed! Why on Earth did they not include a padlock? The 12′ x 6′ Traditional Standard Apex Shed really is one of the most interesting sheds from this line of security themed sheds from Treetops Traditional. We love the look of it and while the one pictured may be a little smaller than the huge 12 x 6 one we are talking about today, it still looks amazing. The depth is 12 feet which clearly is a lot of depth, but with the width being 6 feet it makes it so this what is a large shed can actually be placed into all sizes of gardens and not just really large ones. We are sure the storage space here is going to be very handy as a place to keep things tidy, tools rust free and maybe even a place to hide from the kids and get five minutes peace during the school holidays. While the floor space is more than enough, we are also pleased with how high the shed is. 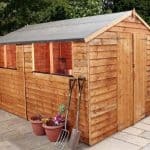 The lowest point of the shed is 5 feet 9 inches which is right around what other sheds offer and the highpoint of the shed is 6 feet 7 inches giving you plenty of headroom. This line of sheds use a fantastic pent roof and it is a real highlight of the shed. The roof is made up with these very strong tongue and groove boards which are 12 mm thick. On top of this there is heavy duty roofing felt which will keep the rain away. In all we are really impressed with this roof and are certain the pent design will work very well at keeping the rain from pooling on top. While this is a shed which is all about giving you a secure place to store your items, it still has a very nice, cool design. We love just how strong the 12 mm tongue and groove shiplap cladding looks. This is the kind of shed where we love to just run our hand along it as the redwood it is made from has a very smooth feel to it. Of course we do not recommend standing there running your hand along it too long as that is sure to get a few strange looks from the neighbours. Behind the cladding we have a frame that is 44 mm x 27 mm. This is a very solid frame and something we have seen on the other sheds in this line. 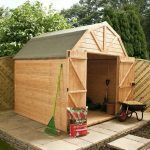 It is a solid frame that because of its size and rounded edges will keep the shed firm and not allow it to become weak. We know that the frame is not the most interesting thing to talk about, but trust us when we tell you that you will be very thankfully for this incredible frame when the shed is still standing strong in your garden 20 years from now. The flooring of the shed is just as solid as the rest of it and you will have no concerns about storing your heavy mower, a ton of the kids garden toys and any other heavy items. It is very smart of Treetops Traditional to use the same 12 mm tongue and groove boards that are used for the roof for the floor. These are very strong boards and actually they do go very well with the rest of the shed from a design point of view as well. All of the redwood will be given a basecoat treatment that is included in the price. Getting this for free is great, but you will still want to give it a thorough coating of wood treatment once you have built it. A fresh coating should be applied each year to keep that lovely looking wood rot free. While other shed manufacturers give very lengthy guarantees, Treetops Traditional only give a year. 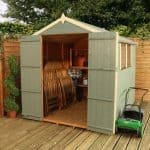 Yes we wish it was longer, but with the materials which are used to make this shed, we honestly do not see you having any issues at all with the shed. Of course any shed that is boasting about offering a lot of security simply must have a solid door. And the 12′ x 6′ Traditional Standard Apex Shed does have a very impressive door. It is 2 feet 6 inches wide and 5 feet 9 inches high which is the standard size for a single door these days. Cheap sheds tend to see their door sag after a few years because of the hinges and the screws used. That is not the case here as the door is held in place with security bolted hinges which of course make the door stay exactly where it should be. The door actually can be placed on either end of the shed so be sure to think what suits you best before you order. Those small windows on the side of the shed are just amazing and something that makes this line of sheds very unique. These are made with strong, horticultural glass and they do have a very interesting look. The point of these windows being so small is that first of all there is no way a person, unless they have some kind of shrinking device can get inside them also they make it very hard to look and see what is stored inside. This is a shed where you items are going to be safe. 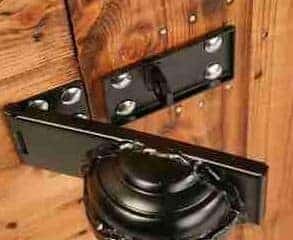 The door is very strong and does come with a padlock protector which is a great touch. However there is no padlock included with the shed which is very odd so you will have to buy a padlock, but this can be done for as little as a pound. 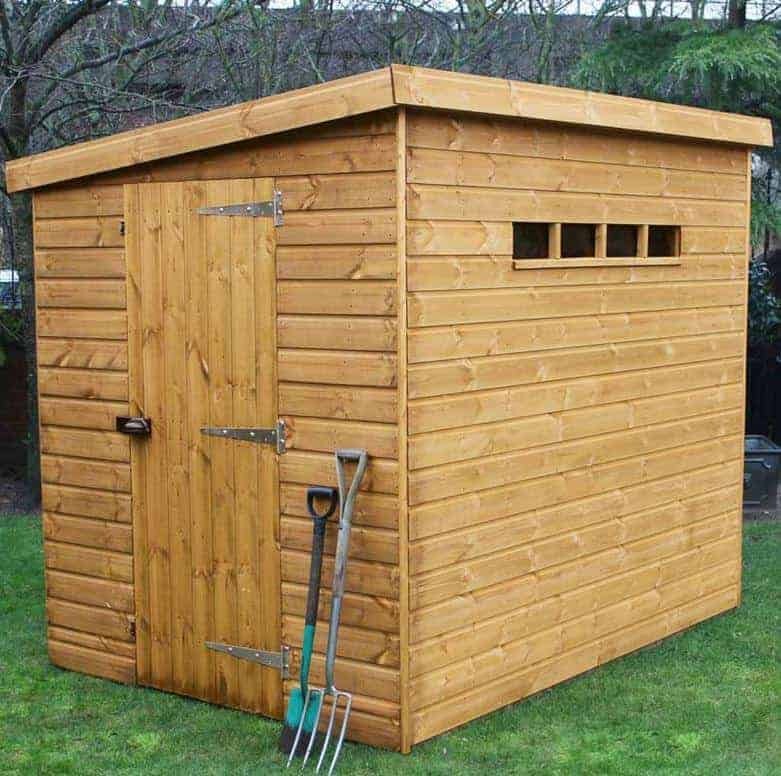 Anyway apart from that this is one very secure and safe shed that when you do add the lock is going to keep your prized belongings locked away. This is one very private shed which is hard to look into thanks to those little windows. Treetops Traditional are known for letting people make changes to the design of their sheds, but this one here is kind of set in its ways. The door can be placed at either end which we mentioned before, but that is all you can really change. One thing though that you can do is treat the shed with coloured wood treatment and make it lighter, darker or even a whole new colour if you want to really shake things up. As far as the extras on offer go, there is an installation service available for £109.99 which is something to consider if you are not too keen on building this yourself. Also there is a set of wooden floor bearers available for, £47.99. These give the floor some more support and also lift of the ground a little. This is a shed where the quality is very high through and through. There really is nothing bad we can say about the overall quality of this shed. As well as designing this shed to keep your items safe, Treetops Traditional have also made sure to use materials that last for many years. 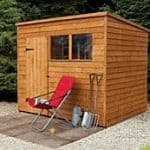 With a little care from you, you will be able to make use of this shed for over 20 years. Some people may be wondering how we can give this a 9 when the width is only 6 feet. The reason for the high score is that you have all that depth and height, but the smaller width allows gardens that are not huge to be able to enjoy this shed. Instructions are included and we do not see you having any issues building the shed. Just be sure to have a person to help you out and a steady flow of drinks and snacks. For the quality of materials used here, we do feel that this is excellent value for money. No corners have been cut here and as a result you are getting a shed that is going to last you a long time, making this one great purchase.